In the spirit of Pro Humanitate, a group of students have created a Wake Forest chapter of Building Tomorrow. The international non-profit organization raises money to build elementary schools in Uganda, where only 50 percent of the population completes primary school. “The government doesn’t have the resources to build the schools,” says Thomas McGinley, a sophomore from Winston-Salem who is vice president of the campus chapter. McGinley, who has been on service trips to Guatemala, says the chapter was formed last fall by students looking for a way to serve those less fortunate than themselves. 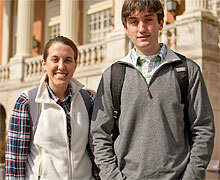 Building Tomorrow’s Wake Forest group formed last fall and has about 15 members who meet weekly. The group accepts donations and is planning a spring golf tournament fundraiser. Their goal is to raise at least $43,000, he said, which will enable members to travel to Uganda and help build a school.